'This one goes out especially for those who love wearing jewelry and if there is anything they love second to that it’s their love for cats. 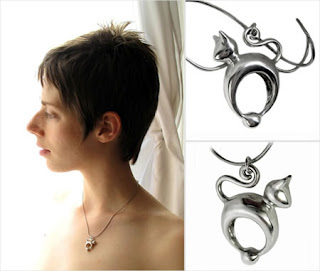 Canadian jewelry artist Rickson Salkeld has brought these two together by combining the feline with feminine pieces of jewelry. These breathtaking and beautiful pieces are created with lost wax casting using precious metals. There is a benevolent side to the designer as well as A portion of all cat jewelry sales will be donated to the Toronto Humane Society.' There’s cat lover necklace for $139.99, cat lover ring for $135.00, brass cat lover pendant for $68.00 and cat lover earrings which go for $127.00.